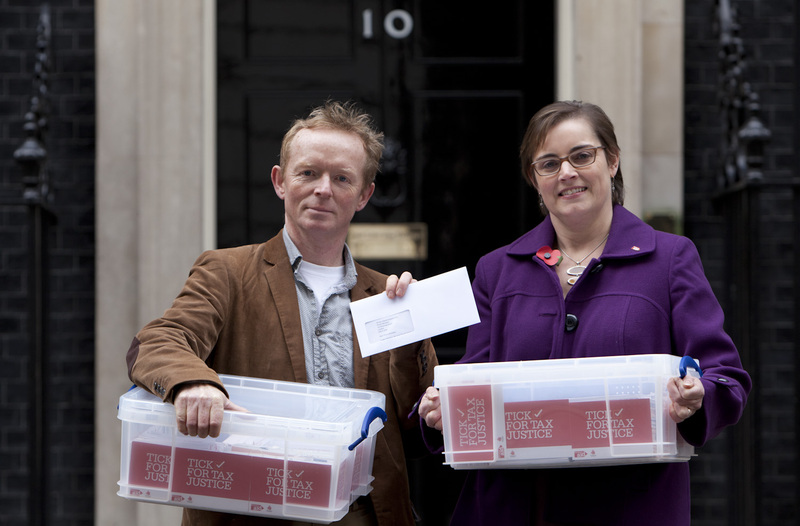 Yours truly, with Christine Allen, Director of Policy, Christian Aid, handing in 10,000 Tick for Tax Justice signatures to Number 10, on Tuesday (6 Nov). Today Christian Aid and Church Action on Poverty are delivering thousands of messages from our supporters across the UK, encouraging you to ensure that strong action is taken next year to enhance tax transparency and curb tax dodging as it affects poor people both in the UK and in developing countries. Our supporters are not alone calling for stronger action to enhance tax transparency. In a recent UK ComRes poll commissioned by Christian Aid 56% of adults polled believed that tax avoidance was morally wrong and 75% think that you, as Prime Minister, needs to demand international action to tackle legal loopholes that allow tax avoidance. The OECD estimates that developing countries lose to tax dodging three times the global aid budget every year. In the UK alone, HMRC has calculated that the cost to the exchequer is at a minimum of £35 billion a year.In difficult economic times, it is more important than ever to close loopholes and enhance transparency to ensurerevenue lost from tax dodging can be invested to improve people’s lives. Secrecy has a corrosive effect on societies across the globe making it difficult for citizens to hold their governments to account, which is an essential building block to prosperous societies. Secrecy in the global tax system is today facilitating tax dodging and fuelling corruption. Next year, as you hold the G8 Presidency you have the power to make fundamental changes to the global tax system to enhance transparency and stop tax dodging depriving developing countries of valuable resources to invest in their own development. As you announced that you will be convening a Hunger Summit next year, we encourage you to put the issue of tax at the center of this agenda. Poor countries can stand up in their own two feet and solve hunger and malnutrition by themselves and in the long-term not rely on aid. So many people with disabilities because they have been ‘found fit for work we need this £35 billion from the rich corporations – especially the ones we subsidise because they don’t pay a living wage! People should be all paying their fair share of tax. That way we can keep the actual tax rates fair and as low as possible for all, rather than meaning those that pay the most tax are only those who choose to be honest.